← Just a Glance – Imagine a Place of Your Own in France! If you were to join us on one of our week-long Experience trips, you’d very quickly realize that Charley and I are living our dream. We’re proof that people have the ability to change direction at any age to pursue the lives they’ve imagined. We love what we do! We spend several months a year in Europe, in some of the most beautiful places in the world. We work with wonderful, interesting people. Our work is incredibly positive… we’re helping people have great vacations. We’re outdoors much of every day. We have incredible meals. And we get to do all this together. I always wanted a job that didn’t feel like work… and now I definitely do. I wish I could say that this was a carefully-planned life and career strategy, but it wasn’t. I was lucky in many ways. For almost 30 years, that quote by Thoreau played in my head. In my younger, idealistic days, it literally hung over my head, on an inspirational poster above my college dorm room bed. Despite a major in English and History, after college graduation I pursued a business career. A year later I headed more aggressively down that path, pursuing an MBA from a prestigious school. Armed with my Wharton MBA, I spent the next 27 years in the corporate world. In 1991 I met Charley, quite unexpectedly. I was a 35-year old VP of Human Resources in a growing company, single, and working 60 to 80 hours a week. Charley was divorced with two grown daughters, working in sales. We were engaged six and a half weeks after our first date. We married the following spring and had our daughter Kelly 15 months later. I was definitely heading in the direction of my dreams. 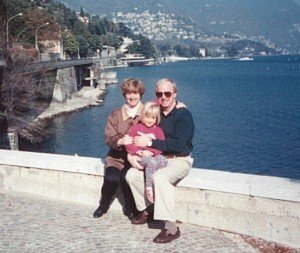 When we talked about our hopes for our married life, Charley and I both said we wanted to travel abroad. Our geographic interests were very compatible: we both dreamed of experiencing Europe. Charley had been to the Caribbean, Mexico and Canada, but didn’t even have a passport. My situation was a little different; I had lived abroad as a child. I was born in Munich, Germany and lived in Melbourne, Australia for four pre-teen years. As a college student and young adult, I always wanted to travel, but it just didn’t happen. So many excuses. I didn’t have the time, the money, anyone to go with. I had a current passport, but it had never been stamped. Then in 1991, right after Charley and I got engaged, I went to Europe with two girlfriends. It was a trip planned before our whirlwind courtship. Cheap airfares and encouragement from my parents helped propel my friends and me across the Atlantic instead of to a beach or ski resort. It was a fast-paced two-week trip to Vienna, Salzburg, Munich, Paris and the Bavarian and Swiss Alps. I loved Europe! And I couldn’t wait to share it with my husband-to-be Charley, the traveling partner I had dreamed of. 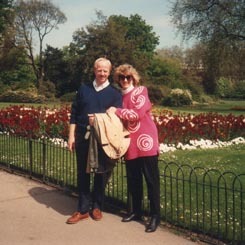 We spent our honeymoon in London, and we’ve been traveling in Europe ever since. In Europe we’ve found everything we enjoy, in the most beautiful places we’d ever imagined. Over the next ten years, with our young daughter in tow, our family vacations increasingly focused on European destinations, first one and then two trips a year. Our travels provided a much-needed break from my often stressful job and never-ending meetings, voice mails, and e-mails. Thousands of miles from problems like layoffs, plant shutdowns, health care costs, union negotiations, and lawsuits, I could relax 24/7 with the two people I loved in a totally different environment. In 2002 something else happened that made dreams possible: one of my former companies went public, and I was still a shareholder. I made some money I hadn’t expected… not a fortune, but enough to give us the confidence to take some risks and pursue some major life changes. In early 2004 Charley and I shocked family and friends when we announced that we’d be going to Europe for 14 months. Kelly was 10 years old. I quit my job in June. Charley put his home renovation business on hold, and we took Kelly out of school for her 6th grade year. We rented our house, sold my new car, and put our personal possessions in storage. We left the USA with a duffle bag and a backpack each. We called our trip “Our Grand Tour of Europe.” Our 14 month trip involved nine countries (England, Scotland, Belgium, France, Spain, Germany, Italy, Austria, and Switzerland), where we stayed in 20 rentals and 34 hotels in a mix of big cities, small villages, and the countryside. We also did two long-distance hikes: 192 miles across England and 100 miles in the Swiss Alps. But we didn’t just travel. We also wanted the experience of “living” in another country. So for six-and-a-half months in the off-season (October through mid-April), we lived in the Luberon region of Provence France. We had been captivated by that area on a 2003 vacation, and its milder climate was appealing for an off-season stay. We found the perfect farmhouse rental just outside the village of Bonnieux, surrounded by vineyards and orchards. Kelly attended the small elementary school in the village, where she became quickly proficient in French. For the first time in my adult life, I didn’t have a job, but my life was full. We explored, made new friends, shopped and cooked, studied French, hiked, hosted friends and family from home. We even took care of the owners’ dog and cat. I was one of the first people I knew to keep a blog. “Our Grand Tour” was an amazing life-changing experience, significantly enhanced by the people we met and the many friends we made along the way. In August 2005 we returned to Knoxville and our old house, but it was impossible to return to our old lives. Charley was approaching retirement, and after the freedom of a non-traditional lifestyle, I didn’t want to return to a demanding corporate job. Flexibility was more important to us than money. 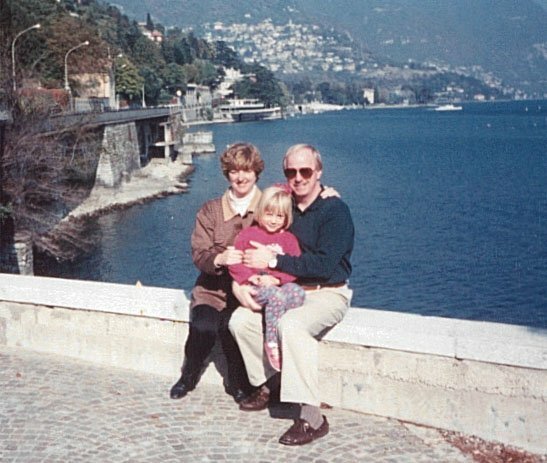 We wanted to stay in Knoxville for Kelly’s schooling and our families, but we also wanted to continue to spend time in Europe. Charley and I had an idea for a small part-time business that would potentially enable us to achieve all these objectives. That business was European Experiences. We’re often asked where the idea for European Experiences came from. 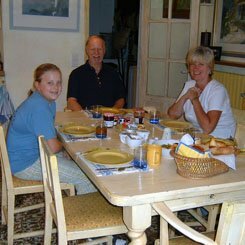 During the time we lived in the farmhouse in Provence, we hosted seven groups of family and friends. It was like running a country B&B and acting as tour guides. We really enjoyed planning our friends’ visits, introducing them to the area, helping them understand the local culture, choosing just the right places to eat. That was the beginning of the idea. Charley and I began to talk about a special kind of small group tour that would help people get to know the real Provence, a week-long “experience” based in the Luberon. The more we brainstormed ideas for The Luberon Experience, the more it became clear that this opportunity was an ideal match for us, bringing together our interests, experience, skills and dreams. We could use our knowledge and interests in history, literature, art, architecture, music, food, wine, and culture. We both had careers that involved working with people, and we could engage with people in a very positive way. We’d be outdoors surrounded by spectacular scenery. And we could use our business skills to build something we were truly passionate about. Best of all, it was something we could do together, working as a team. 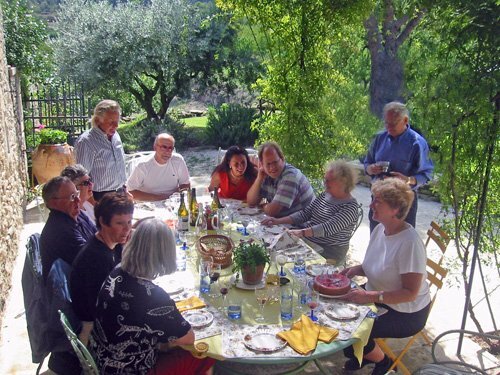 We hosted our first Luberon Experience groups in Provence in September 2006, based in our village of Bonnieux. Our first two groups were small, including some trusting friends from Knoxville, one friend’s sister, a wonderful couple from California who knew us through the Slow Travel website, and an adventurous woman from Oregon who discovered us on the internet. Several other friends who were traveling independently in Provence joined us for a few activities during those two weeks. Sometimes you’re just in the right place at the right time. Our September 2006 trips took place just a few weeks before the Ridley Scott/Russell Crowe movie “A Good Year” was released. The movie, based on a book by Peter Mayle, was filmed mostly in the Luberon, and the major filming location was a wine estate just outside Bonnieux. While we were in Provence with our groups, we were contacted by a USA Today travel writer working on a feature story about the Luberon, Peter Mayle, and the movie. She had found us on the internet. The writer Laura Bly and her husband ended up joining our second group for a full day. We were mentioned in a sidebar to Laura’s article in USA Today, with a link to our brand-new website. What great fortune to have that kind of visibility just a few months after we started our trips! We had over 800 visits to our website the day the article appeared. Our May and September 2007 trips filled quickly, and interest continued to grow and develop from that beginning. We’ve welcomed 20 groups to Provence in our first five years. 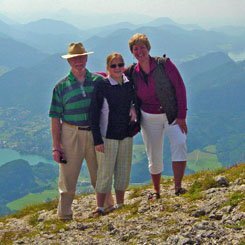 In 2009 we expanded to offer trips to other areas of Europe that we know well, and we’ve now hosted groups in the Salzkammergut of Austria, the Bavarian Alps of Germany, and the Cotswolds in England. Next year we’ll have two groups in the Chianti region of Tuscany, Italy. Our work with European Experiences has enabled us to connect with so many wonderful people. We now have friends all over the USA, and in Canada, Australia and New Zealand too. Most of the people in our “new” trips have traveled with us before, and we love being with them again. Next year we even have five people coming back to Provence for a second Luberon Experience. Meanwhile, our dreams have taken our family’s lives in other new directions too. We now spend about three months a year in Europe, and nine months at home in Knoxville. Charley is semi-retired, and enjoys doing volunteer work, writing, woodworking, and home improvement projects. Kelly is busy applying to colleges and getting ready for her more independent adventures. We’re proud of the young woman she’s become, and the impact her European experiences have had on her plans for her future. A part-time teaching opportunity at the University of Tennessee led to another new career for me, one that complements our travel business. My part-time role soon became full-time, a nine-month appointment which provides summers off and a lot of flexibility. My teaching now focuses mostly on international business, and it’s fun to work with and mentor young people who are excited about international careers and experiences. My new teaching career has opened up other international opportunities for me too, such as my two week trip to China earlier this year. I haven’t always moved confidently, but I’m definitely living a dream… a life I once only imagined. The other members of Slow Travel Tours have their own stories, each one an interesting personal journey. We all share something very special: we’ve shaped our lives to pursue our dreams and passions. We lead small group tours because we want to share places we love with other people. It’s so much more than a job or a business, a way to make money or get a free trip to Europe. Our trips are very personal; they aren’t subbed out or led by hired guides… our travelers are with us! We’re passionate about creating unique experiences. We love sharing different, often simpler lifestyles and traditions. And we celebrate slowing down to savor some of the world’s most beautiful places. 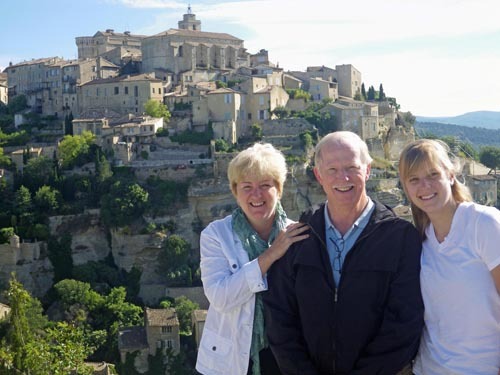 Kathy and Charley Wood lead European Experiences, week-long “slow tours” in some of the most beautiful areas of Europe, including The Luberon Experience in Provence, France. Their 2011 trips will include three weeks in the Luberon and two weeks in the Chianti region of Tuscany, Italy. Kathy and Charley have been traveling in Europe for almost 20 years and love sharing their special places in Europe with others travelers. Read more about Kathy and Charley here. They’re looking spending a special family Christmas in Bonnieux… and to next year’s groups in the Luberon and Chianti.